For athletes seeking fitness, the most important rule is never miss a workout. But everyone has bad days-work demands, unexpected errands, and changes in family plans make sticking to a training plan seem as difficult as the workouts themselves. One-Hour Workouts: 50 Swim, Bike, and Run Workouts for Busy Athletes means never missing a workout. Athletes can rescue the day and stay on track using these base, tempo, and speed workouts to meet today's training goal in just one hour, from warm-up to cool down. 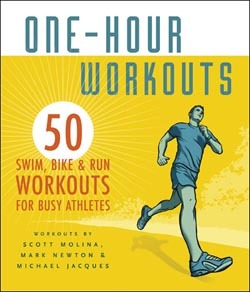 One-Hour Workouts is now available in bookstores, bike and tri shops, and online. 5 free workouts and the table of contents are available at velopress.com/workouts. Endurance coaches Mark Newton, Michael Jacques, and triathlon legend Scott Molina offer busy athletes their 50 favorite no-nonsense workouts for swimming, cycling, and running. Each workout is efficient yet challenging so that athletes can get in a quality training session before daybreak, over lunch hour, or whenever they can steal the minutes. One-Hour Workouts is designed for ease of use. The book is compact and sweatproof so it's easily stashed in a gym bag or desk drawer, and the workouts are grouped for quick reference. The coaches offer tips to develop good form, and they explain how to modify workouts throughout the season to match an athlete's current fitness. In addition to the 50 swim, bike, run workouts, One-Hour Workouts includes 10 bonus workouts for strength training, crosstraining, bricks, and technique drills. With One-Hour Workouts, busy athletes don't have to sacrifice their training to the full catastrophe of daily life. Scott Molina ("The Terminator") claimed 104 victories as a professional triathlete. Molina now trains, races, and coaches triathletes in New Zealand. Mark Newton is an exercise physiologist with a degree in Exercise and Sport Science from the University of Sydney. He has worked with triathlon stars Chris McCormack and Normann Stadler. He lives in Sydney, Australia. Michael Jacques is a multisport coach and elite-level distance runner with over 15 years of coaching experience. He lives and coaches in New Zealand. VeloPress is an endurance sports and fitness publisher of books for cyclists, triathletes, and runners. VeloPress is the book-publishing division of Competitor Group, which publishes VeloNews, Triathlete, Inside Triathlon, and Competitor magazines and produces the Rock 'N' Roll marathon and half-marathon series, the TriRock triathlon series, and the Muddy Buddy adventure race series.